We have all heard the old saw…”You can’t see the forest for the trees” and I think that it originated in Walt Disney World. The most magical place on earth is literally a treasure trove of visual, audio and olfactory treats for the senses. 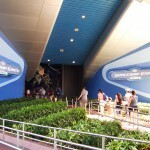 There is nowhere one can go in the parks that does not contain one or all three going on at the same time. Walt Disney never wanted his Disneyland to be just a place for people to ride the attractions or see the shows. He wanted his guests to be totaled “Immersed” in the experience, to be a living part of the attraction or show. 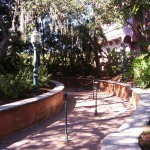 For example, walk into the Magic Kingdom. The first name on the upper window of the train station is Walt’s window. 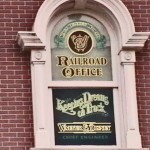 “Keeping the Dreams on Track” Walter E. Disney, Chief Engineer. Think of the whole experience as if walking into a theater, or reading a book. There is the table of contents. As you walk under the station, observe all the posters depicting the attractions you will encounter. As you walk on the “Red Carpet”, the first thing you see and smell is the popcorn machine, like in a movie theater, then as you walk down Main St. look up at the names on the upper floor windows, the “Credits” so to speak of all the people and companies that helped make the Magic Kingdom a reality. 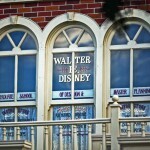 And when you leave, you will see Walt’s window upstairs in the Ice Cream Parlor. So in a sense, as in Disneyland, the experience is that you are part of the show. And it’s a shame that so many guests in their hurry to get on all the attractions; see everything they can, miss all this rich detail. But I can understand it, most vacations are from 5 to 8 days and time is limited. But I digress. I felt a need to point this out because of other “Major Details’ that many guests miss out, or are not just aware of…The Disney Queue Lines. Almost everything in Disney has a backstory…The attractions, shows, areas (Pleasure Island has one Disney’s most detailed and complex backstory)* even the resorts (Fort Wilderness Lodge is another great yarn!) have their tales. Almost all the attraction Queue lines are an attraction unto themselves, each rich in detail, giving everyone a preview of what’s in store. All of this in keeping with the great storytelling prose of Walt Disney. But to explore all the Queues would take a small novel, so I would like to point out some of my favorites and some of the many “Hidden” gems you might have missed…And remember, the Queue lines do not have to be long or very detailed to enjoy and discover what makes Walt Disney World so magical! 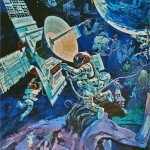 SPACESHIP EARTH…I have a special love for this iconic attraction. 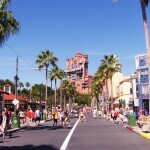 I first rode it a month after EPCOT opened and I still enjoy it, even after countless times. This queue is simple, yet elegant. 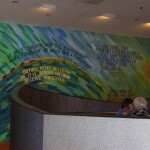 A mural by Italian artist Claudio Mazzoli sums up the entire attraction, yet it also tells the story of EPCOT’s Future World, Man’s advancement from the stone-age to the exploration of the stars. When in the queue, look at the beauty and detail of this mural. From stone-age men painting on cave walls to astronauts working on a space station, you immediately know what’s in store in the attraction, which is communication. 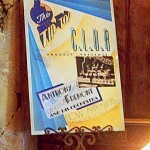 (There is also a great Hidden Mickey in the mural, but I won’t reveal its location, you must find it!) Keep looking at the piece; you’ll see in-between scenes of man’s triumphs through the years. And Spaceship Earth has a very unique smell! It has not changed since I first rode. 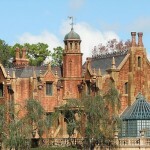 HAUNTED MANSION… My favorite attraction, hands down. Now we get to the more elaborate and detailed Queue lines. The Haunted Mansion has a long and storied past, much too intricate to be covered here, but needless to say, Walt was very involved with the attraction and its Queue reflects this. Your adventure begins before entering the Queue. You approach the eerie Mansion, and if you look closely at the windows, you can see (Especially at night) shadows and light moving across inside, and keep an ear out, you will hear occasional thunder and howling. Look at the front door of the mansion, the two columns alongside are coffins. You will also notice the most of the windows in the conservatory are cracked. Keep an eye out for the concrete chess pieces on top of the mansion, only the knight is missing, because the “Knight” is inside. Ever since 2011 when the addition of the interactive cemetery was added, the Queue became just more magical. Thankfully, the original Madame Leota tombstone was retained, you know, the one with the copper face of Leota, whose eyes open and look around, than close, an amazing effect. With the addition of the “Ravenscroft Organ” (Dedicated to voice actor Thurl Ravenscroft), the musicians touch “Music Box” Master Gracie’s Tombstone and more, this Queue is surely an “Attraction” in itself and another reason to not rush, but to take some time to observe and appreciate all the detail Disney has to offer. A quick note… all the names on the tombstones are nods to the Imagineers and craftsman that made the Haunted Mansion a reality. Check them out; there are thirteen stones, very lucky! Once inside, keep an eye on Master Gracie’s portrait over the fireplace, and watch it change into a corpse. 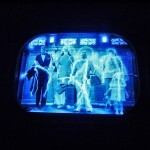 These amazing effects are done with six projected images on 35mm film with eight frames and overlap each other. Inside the “Stretching Room” gallery, note all the detail, especially the gargoyles (Which giggle) and the domed roof where you’ll see Master Gracy hanging before entering the attraction. Listen carefully, as the room stretches, you can actually hear creaking and popping noises, Disney misses nothing! There is of course, tons and tons of other items I could point out, but I wanted to let folks who were not aware of some of these amazing details a chance to pick them out themselves and see just what Disney has put into these Queue lines. TWILIGHT ZONE TOWER OF TERROR… While the Haunted Mansion is my favorite attraction, the Tower of Terror Queue line for me is the most detailed and beautiful of all Disney attractions. The storyline of this eerie Hotel is based on what most experts concur is one of the greatest Sci-Fi anthology TV series in history, Rod Sterling’s “Twilight Zone”. And like the Haunted Mansion, your Queue line “Attraction” begins long before you actually enter. As you make your way down Sunset Boulevard, the Hollywood Tower Hotel (Modeled after the famed real-life “Hollywood Tower”) looms majestically at the end of the boulevard, stately, but yet ominous. Instead of rushing up to ride, take your time, for there are so many “visuals” and “audios” to be had, even before entering the Hotel Lobby. As you approach, you can hear the screams from the guests as the elevator drops, adding to the drama about to unfold. Approach slowly, and keep looking around…Immediately to the right in back of the fast pas kiosks, note the garden shed once used by the Hotel. Also spot the sign “Sunset Hills Estates Est. 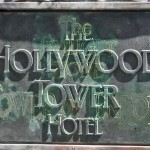 1923, which is a nod to the original sign “Hollywoodland, Est. 1923” built to advertise a real estate development called Hollywoodland. The gates mark the entrance to the hillside beyond with its collection of homes and cottages. Inside the lobby, (Again, just take the time to grasp the wonderful detail!) there is much to see. To the right is the concierge desk and behind it a sign for the Hotel’s Tip-Top Club. On your left there is a table with an unfinished game of mahjong (Imagineers actually had expert Mahjong players set up the game, ensuring accuracy!) and next to it a tea cart. A quick note… There are many references to episodes of the Twilight Zone show. The band leaders’ name, Anthony Fremont is a nod to the episode “It’s a Good Life.” Here a little boy (Played by Billy Mumy of “Lost in Space” fame) put people in a cornfield just by thought. As you wind around the queue line, look to the left of the lobby by the window. 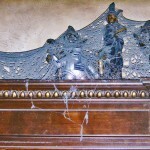 Here is a table that a couple was celebrating a wedding anniversary when the lightning struck. Also observe all the fine statuary and other sculptures around the lobby, prevalent to all fine hotels of the era. Now we will enter the library and understand the eerie story behind the Hotel. You will pass two elevator shafts, both with broken doors and a sign stating…”Out of order” The doors to the library open (Right or left library queue rooms are the same) and you again are immersed in the story. Inside the library you are plunged into a room teeming with artifacts on shelves and tables, all old and neglected. This is one bizarre room, with a window revealing a lighting storm outside, like the one on October 31st, 1939. But this room, for one with a well-honed eye, has many items that recall famous episodes of the Twilight Zone. One of my favorites, located on the table of the back bookcases, is the book entitled “To Serve Man” from the episode of that title. Another piece is a devil-headed “Mystic Seer” fortune telling machine from the episode “Nick of Time” starring Bill Shatner from Star Trek. Another classic piece is a small robot from the episode “The Invaders” with famous star Agnes Moorhead (Endora from Bewitched). 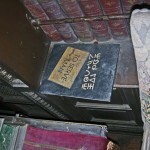 If you look to the back wall, you’ll notice a trumpet from the episode “A Passage for Trumpet” starring Jack Klugman (Oscar from the Odd Couple) and underneath it is a piece of sheet music entitled “What, No Mickey Mouse?, what Kind of a party is this?” This, by the way is considered a “Hidden Mickey”. As the room goes dark, with crashing thunder and lightning, and Rod Sterling appears on the TV (This is from the episode “It’s a Good Life”) where he explains what happened that fateful Halloween night. The Hotel, at its zenith in Hollywood’s golden era, was a magnet for the Hollywood elite. 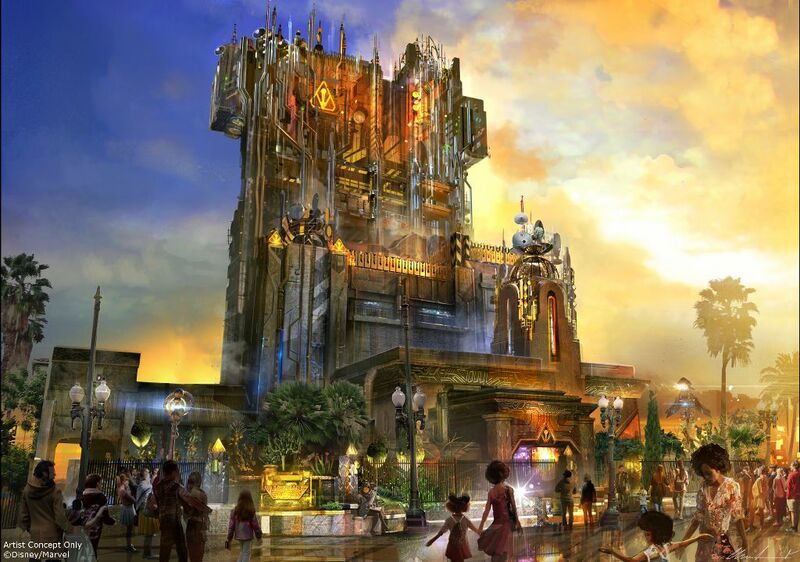 We see two (Presumably a famous Hollywood couple), a bellman, a little girl (Look at the little girl’s hand, she’s carrying a Mickey Plush doll, another “Hidden Mickey” in the attraction) and her nanny board the elevator, when lightning strikes the elevator shafts, pulverizing them and sending the five unlucky souls to the Twilight Zone’s “Fifth Dimension” It was after this occurrence that the Hotel was abandoned and falls into disrepair. Another interesting note… I always believed that Rod Sterling was speaking in the pre-show clip, but it is not his voice, but that of voice actor Mark Silverman. Once the preshow is complete, you enter the Boiler, or Mechanical Room. Again, here is why Disney is ahead of any other venue. All the fantastic furnace room props, the boilers, pumps, gauges, pipes, condensing tanks etc. if were real, would function as a real, working boiler room! 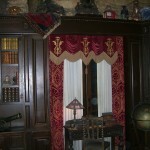 When in this room, please take your time to look at the incredible detail the Imagineers put into the area. Along with the sounds and lights fading in and out, you ARE in a furnace room. As you can see, for anyone who takes the time to slow down and observe, the Disney Queue lines are like nothing else, and are indeed, attractions in themselves. I have just scratched the surface on some of the details on the showcased attractions. I wanted to point out with these few examples of how much you can miss by “Not seeing the forest for the trees” There are of course, many more attractions, all with amazing and detailed Queues… The Jungle Cruise, Big Thunder Mountain, and another of my favorites, Splash Mountain. I hope the descriptions of the aforementioned icons might whet the appetite. But why would Disney spend vast amounts of money and time for all this incredible detail, and include a backstory to boot? Because of Walt Disney and his belief in a strong storyline and giving guests more than expected. So the next time, no matter what attraction you are in, take a deep breath, slow down a bit and look around. 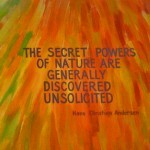 You be surprised at all the additional magic you might find. ← The Elusive Disneyland Candy Cane…Or Is It?